From the roof to the Earth, TRITOflex provides excellent protection from corrosive elements. WorleyParsons is a large multi-national company providing various services within the resources, minerals, and energy sector throughout the world. 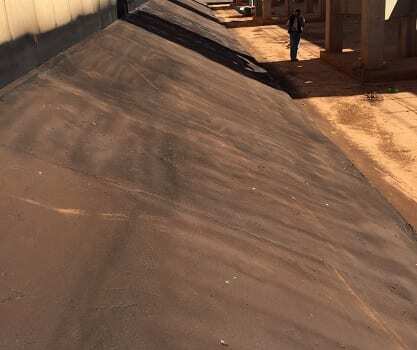 In South Africa, they called upon licensed applicator Flex-o-Tek to help provide a solution for a waste water treatment facility where the sloped concrete walls were failing. In addition to becoming a very flexible, impermeable, and non-breathable membrane, TRITOflex possesses high resistance to a long list of chemicals and acids. This made it an ideal candidate for a waste waster containment area. 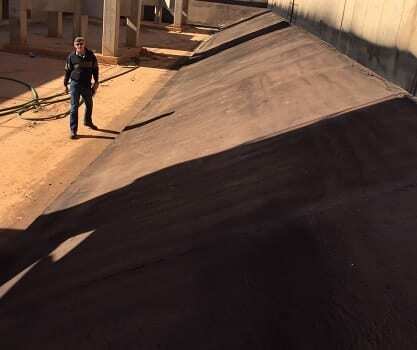 TRITOflex was spray-applied in one coat at a 2 mm (80 mils) dry thickness directly to the cleaned concrete walls, covering approximately 3,500 m2 (37,000 sf) of area. Now, the waster water that enters this containment area is no longer soaking into the concrete and causing concerning hazardous situations. WorleyParsons has now continued to seek out the Triton line of products to solve other building envelope concerns throughout their facilities.